For almost the past year, a city of Maple Ridge, located east of Vancouver, was terrorized by a rash of cat killings. Domestic house cats were disappearing, with pieces of their dismembered bodies later seemingly deliberately left for their owners to find. A forensic veterinarian claims a coyote’s sharp teeth and strong jaws can bite a smaller animal in half. Even more perplexing was that the killings came in waves. Investigators believed a human — probably a boogeyman serial-killer akin to Hannibal Lecter or Dexter Morgan — was responsible. Citizens were warned to keep an eye on their cats and watch for suspicious activity. The first batch of killings took place in 2011, from June to August, when the parts of 12 dead cats were found. The killings started again in the spring of 2012, with another dozen cats killed. After working with a forensic veterinarian, however, the British Columbia Society for the Prevention of Cruelty to Animals (SPCA) has concluded that killings were probably done by coyotes or foxes — not a human. “Despite strong indicators suggesting human involvement, these animals were the victims of a coyote or some other type of predator,” Marcia Moriarty of the BC SPCA says. 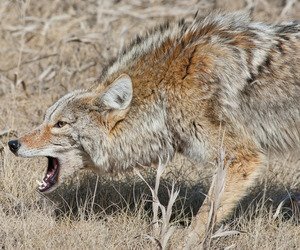 Dr. Melinda Merck, a forensic veterinarian, suspects the culprit may be coyotes, as they have a combination of powerful jaws and sharp teeth that can bite an animal in half. Merck also addressed the issue of the animal parts — some of which appeared to be deliberately left in specific locations. Another clue that pointed to an animal predator was the cats’ claws that were recovered; in several instances, they had ensnared tufts of fur in their front nails, presumably that of an attacking animal. Although a human has been ruled out as the culprit in the killings, Maple Ridge and surrounding area residents are encouraged not to keep their animals unattended when outdoors.